Through try and error, I got one of my repos to build. As to what I did and tweaked to get it working, I couldn’t remember. First, let’s conjoin on the same page for clarity. Here’s what this article helps achieve, specifically! This tutorial assumes you already, can communicate with your remote server from your local machine (the PC/laptop you’re sitting behind) via SSH. At this point, if you have no idea what SSH is, you may close the browser tab, and have a nice day! If the above is your scenario, which was mine, let’s rock and roll. Follow these instructions carefully. I’m going to be very thorough with the steps. Log into your remote server, namely, the one in the cloud, in other words, the one where the files will be copied to from the Circle CI. Note: We’re using >> so that the for_circle.pub contents are appended to the end of the contents in the authorized_keysfile, rather than override the contents in the authorized_keyswith only the for_circle.pub contents. Remember, everything we’ve done so far is on the Remote Server. Now, on the server, in the previous steps, 2 files were generated from the ssh-keygen command. We’ve only used the for_circle.pub file. The other one is the for_circle(without the .pub extension). Then as shown in the GIF above, copy the entire key. Now, add the private key contents you copied (the one into clipboard), paste into “Add Private Key” dialog box. 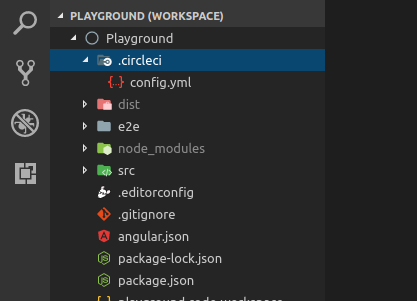 With the steps above completed, we’re left with only a single step more, namely, our .circleci/config.ymlfile. # doing no strict host key check is a security risk to some extent. The above file, config.yml, kindly put it in a folder called .circleciin your project root directory. Commit the config.ymlchanges, and push to your repository which is tied to your CircleCi. It should build and push to the droplet without any errors. If all is well, you should be able to re-run your build as SSH (done from the CI dashboard), ssh into the CI Image, then from there, ssh into the remote server without any issues.